It’s as obvious as a Presidential comb-over that Liz Chambers has a secret, and so commences this insightful crime novel. Valued by her bosses as a paralegal secretary, doting on her new baby Jake and a loving Mother to teenager Dan, with husband Gareth at her side - Anita Waller paints a portrait of Liz Chamber’s idyllic family life, or so it appears. Then, with the abduction of young Jake from his childminder’s house, the author takes some turpentine to her canvas and starts dabbing at the edges of Anita Waller’s picture-perfect life. Soon there are secrets revealed that erode the fantasy existence illustrating that beneath the watercolours of Liz Chamber’s life lurks a tale of love, jealousy, enmity, revenge and of desperation. Soon the view of Liz Chamber’s life turns from a pastoral landscape to one of a Hieronymus Bosch painting in a couple of turns of the page. It appears that somebody is out to make Liz pay for a real or perceived wrong and they’ve planned meticulously to make sure that it will cause her grave pain and utterly shatter her home life. Anita Waller has captured the terror, desperation and hope of a mother for the safe return of her baby with verve. The sense that Liz has had the rug pulled from under her feet and no longer knows if she can even trust the Police, is palpable, so the reader experiences that anxiety up close [and personal]. 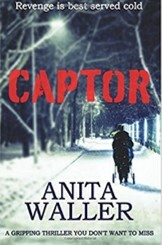 The anger, frustration, fear and guilt are evident as she’s a fully-fleshed and believable character, as she is transported onto a white-knuckle ride in the hope of the safe return of her child, and that of the man she loves. There is an authenticity about the proceedings that makes this a very credible and commendable crime thriller.